Mr Abdul Hameed Umar Kathap, a trader who is a father of three hailing from Neariya-ku'lam, Maangku'lam in Vavuniyaa, was abducted while he was on his way to Colombo from Vavuniyaa in January 2009. Later, the notorious ‘Terrorist’ Investigation Department (TID) of occupying Colombo informed his wife, Ms Segu Mohadeen Noorjahan, that her husband had been imprisoned on the charge of assisting the Liberation Tigers of Tamil Eelam (LTTE). The only ‘evidence’ the TID has was a confession obtained from Umar Kathap through torture. On 03 April 2015, Anuradhapura High Court had dismissed the confession statement. However, the TID was still keeping the victim imprisoned, legal sources told TamilNet. 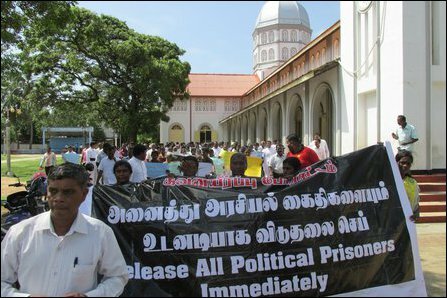 The political prisoners on Saturday resumed their fast-unto-death demanding the SL President to negotiate their immediate release with Northern Provincial Council Chief Minister Justice C.V. Wigneswaran. 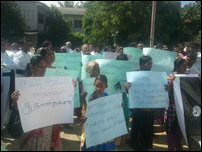 The Sri Lankan regime has refused to consider the imprisoned Tamils as political prisoners. 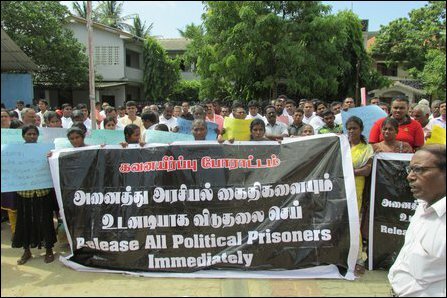 The adamant refusal to recognise the Tamil-speaking prisoners as political prisoners has drawn wide-scale protests also calling the role played by the collaborative sections among the Tamil National Alliance into question. TNA Parliamentarian M.A. Sumanthiran, who had requested the prisoners to call off their earlier hunger strike, was confronted by a crowd of angry Diaspora activists in Australia last week. The prisoners on hunger-strike have denounced the deceptive offer from the SL State giving bail for some of the prisoners, ‘military rehabilitation’ for others and the classification of more than 40 as involved in serious crimes to serve their terms. The daughter of a 62-year-old Thangamalar jailed by the TID since April 2014 at Welikade prison was blamed for renting out her house to a former LTTE member, whom the TID later blamed for attempting to re-group the LTTE. The accusation was made by the TID in an alleged smokescreen campaign. 33-year-old Sasitharan Sakunthala, the daughter of Ms Thangamalar, said her mother was imprisoned on no valid legal ground and that she had no political intention behind the rental. 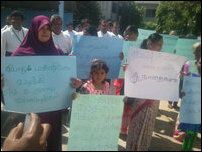 TNA parliamentarians representing Vanni district, lawyers, civil society activists and Catholic priests took part in the protest, which was organised by the Citizen's Committee of Mannaar. 04.11.15 Tamil leadership need not shy away or react to unfair challe..